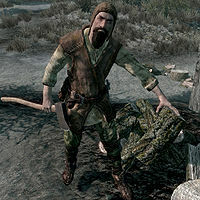 Jorgen is a Nord lumberjack who runs the mill in Morthal. He doesn't care about either side in the war, he just wants to get his work done. Not far from the mill is the house he owns with his wife Lami. 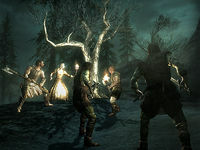 Jorgen is also the bearer of the hilt of the fabled Mehrunes' Razor, which has been in the possession of his family, Clan Axe-Bearer, for eight generations. He does not trust Idgrod Ravencrone as a ruler. If you say that he seems to be upset at something, Jorgen will angrily reply, "The world's going mad, and our Jarl does what? She hides inside with her 'visions'. We need a leader, not some mystic!" You can then ask him if he doesn't trust the jarl, and he will say, "How can I? She never speaks with us. She's allowed this wizard, Falion, to live in our midst practicing gods-know-what. And now there's talk of rebellion, and dragons? What help could Idgrod be against them? No, we can only rely on ourselves. You'd do well to remember that." Should the town come under Stormcloak control, Jorgen will instead complain about the new jarl being too concerned with herself: "The world's going mad, and our Jarl doesn't care. She's only in it for herself. If she's the best Ulfric has to offer, we might've been better off with the Imperials." When not engaged in conversation, he may grumble, "We've gone from a Jarl lost in her own head to a Jarl that cares for nothing but herself. Lot of good that does us." He wears a set of farm clothes, a pair of boots, and a hat. He is equipped with an iron sword. He carries a key to his house, a key to his chest, a torch, and a selection of common loot and gold. He also owns a bed inside the Moorside Inn which you can sleep in if you befriend him. This page was last modified on 13 August 2018, at 02:51.